Titles you've borrowed from the library will automatically be returned at the end of their lending periods. 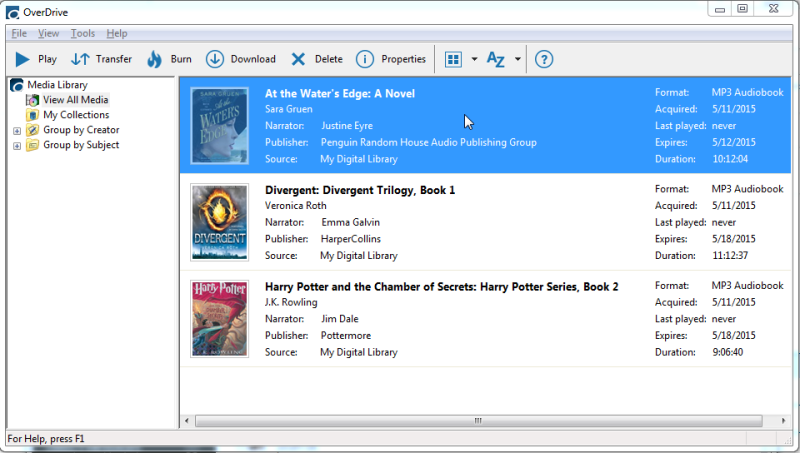 However, if you finish audiobooks before then, you can return them using OverDrive's desktop app for Windows (to free up space in your library account). Note: If you're using OverDrive for Windows 8/10, visit this article to learn how to return downloaded titles in that app instead. In OverDrive for Windows, select the audiobook you want to return. Click Delete to see the return options. Click Return/Delete to both return the audiobook to your library and delete it from your computer. Click Delete to delete the audiobook from your computer. It will stay in your library account until the end of its lending period, so you can download it again.